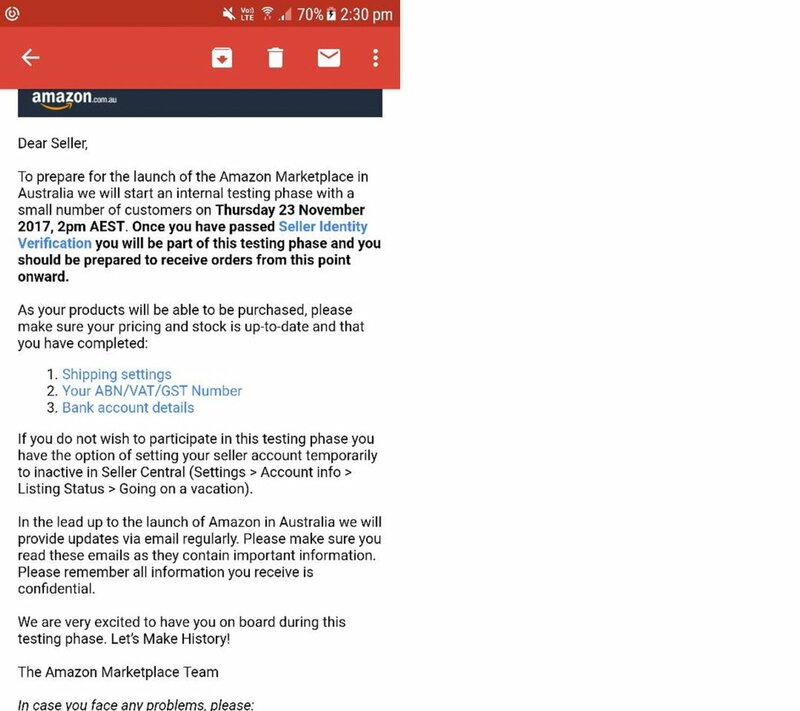 Amazon Australia executed a 'soft launch' at 2pm yesterday with "an internal testing phase", as sellers receive email urging "let's make history." Amazon Australia soft-launched to “a small number” of customers at 2pm yesterday (Thursday 23 November), with a full public launch expected next week. The initial launch was signalled in an email to select Marketplace Sellers on Tuesday, advising "be ready to receive orders by 2pm AEDT, this Thursday, November 23." "As your products will be able to be purchased, please make sure your pricing and stock is up-to-date." The email added the company "will start an internal testing phase with a small number of customers". Based on precedence in other countries, Amazon will absorb losses early on to establish its market presence, according to research firm IBISWorld, as the web giant will significantly undercut local retailers. “The company intends to challenge domestic retail prices by offering items for 30% less than domestic retailers. This is expected to appeal to price-conscious Australian consumers, and is likely to affect local retailers that have found it difficult to adjust to a shift in consumer spending behaviour over the past five years,” said IBISWorld senior industry analyst Kim Do. Lifehacker.com.au broke the story, publishing a copy of the email to sellers. Australian third party merchants pay $49.95 plus GST monthly to sell on Amazon, plus 6 per cent to 15 per cent commission on products to the world's largest internet company by revenue. Lifehacker says it not known how many sellers or customers will be part of the testing phase, but in recent days it's been clear that the Australian website is being populated with products from leading brands such as Dyson, Sunbeam and Huawei, including toasters, electric blankets and smartwatches. Products from the AmazonBasics white-label range as well as HP computer products have also appeared briefly before the pages were hidden again. All those item pages have now also been removed from public view. The company's fulfillment centre in Dandenong South in outer Melbourne has been preparing with staff on since since last month. Meanwhile global research consultancy, Gartner, has advised retailers not to panic about the arrival of Amazon. Gartner VP, Miriam Burt, presenting at the 2017 Gartner Symposium in the Gold Coast earlier this month, recommends less panic, more planning. She outlined a Nine Point Plan of Attack for Australian retailers.